Former conductor of the Blanchardstown Brass Band, Pat O’Brien, passed away on July 28th last. 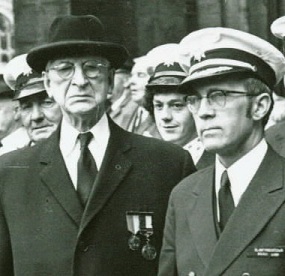 He conducted the band during the 1970s and is featured in one of our most famous photographs with President De Valera below. He was the Head Usher in Leinster House for a considerable period of time and was also involved in the Army School of Music. He will be sadly missed, R.I.P.